News for the Heart talks with Path 11 on Evolution! News for the Heart, talks with the Producer April Hannah and Director Michael Habernig on The Path: Evolution. The Path: Evolution explores the theory that human beings are living in a virtual reality system similar to the rules of an assimilated video game. The film briefly discusses the societal fears of the Mayan calendar ending in 2012, and delves into the importance of humans moving more towards a state of love and cooperation as a vital part of life in order for consciousness to evolve.The filmmakers follow former NASA nuclear physicist, Thomas Campbell ashe shares his knowledge and the results of his research via hundreds of YouTube presentations and his trilogy, My Big TOE. Campbell derives the unified fundamentals of consciousness, physics, metaphysics and morality, to explain mind and matter, normal and paranormal, life, death, and purpose, with all of this logically flowing from the concept of reality as information.Out­of­body expert William Buhlman, remote viewer and former President of The Monroe Institute (TMI) Skip Atwater & former Executive Director of TMI Paul Rademacher, join the conversation in the third film that covers a 7 year span from 2008 to 2015. The Path: Evolution will undoubtedly challenge the viewer’s current belief systems and leave a lasting impression on human beings to re­evaluate how they are behaving, treating others and existing in the world. This film will also create a high level of curiosity for the viewer to investigate the idea that there are different states of consciousness the human can explore if they can detach from the identity of being in the physical body. “It has been a long 8 year journey since we started filming the trilogy. I believe this project has helped change not only our lives, but hundreds and possibly thousands of other people lives by watching our experts explain the concepts of consciousness and teaching people ways to remove their fears, drop their belief systems and explore the concept that we as humans are more than our physical body” says April Hannah, producer. “Each film was meant to be able to stand on its own. But now watching the trilogy as a whole, it now has new meaning as one dynamic film with interwoven footage over the course of 7 years” explains Michael Habernig, the film’s director. 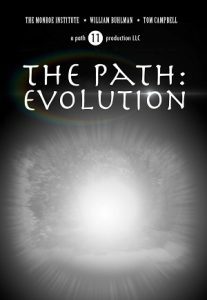 The Path: Evolutionis now on sale for DVD or on­line streaming exclusivly at www.thepathseries.com, along with bonus material of deleted scenes and extended interviews. The Path: Evolution documentary discusses how the collective human consciousness has been and will always be evolving through human behavior. The film explores the theory that human beings are living in a virtual reality system similar to the rules of an assimilated video game. Depending upon how you play the game you will either evolve or de­evolve your consciousness. Excerpts taken from the early work and investigations of Robert Monroe’s’ explorer series from the late 1970’s are included in this film and almost 40 years later experts in the field of consciousness are still saying the same thing and that is that everything comes back to being love. The film briefly discusses the societal fears of the Mayan calendar ending in 2012, and delves into the importance of humans moving more towards a state of love and cooperation as a vital part of life in order for consciousness to evolve. The Path: Evolutionis the third film of The Path Series trilogy and picks up right where The Path: Beyond the Physical leaves off and answers the questions, what is the point of being in a physical body, how has consciousness evolved over the centuries and where is the human collective consciousness going from here? The filmmakers follow retired NASA nuclear physicist, Thomas Campbell, as he shares his knowledge and the results of his research via hundreds of YouTube presentations and his trilogy, My Big TOE. Campbell derives the unified fundamentals of consciousness, physics, metaphysics and morality, to explain mind and matter, normal and paranormal, life, death, and purpose, with all of this logically flowing from the concept of reality as information.Out­of­body expert William Buhlman, remote viewer and former President of The Monroe Institute (TMI) Skip Atwater & former Executive Director of TMI Paul Rademacher, join the conversation as well in footage covering a 7 year span from 2008 to 2015. The Path: Evolution will undoubtedly challenge the viewer’s current belief systems and leave a lasting impression on human beings to re­evaluate how they are behaving, treating others and existing in the world. This film will also create a high level of curiosity for the viewer to investigate the idea that there are different states of consciousness the human can explore if they can detach from the identity of being in the physical body. The Path Trilogy is a 3 part documentary series taking the viewer on the same path, director Michael Habernig went on when he began questioning his existence on earth. Film 1, The Path: Afterlife investigates the big questions of life, what happens when we die, is there life after death, is there proof we are more than out physical bodies? After finding the answers to these questions, one will then ask, how do I get outside of my physical body to explore these spiritual realms and multiple dimensions in the universe? Film 2, The Path: Beyond the Physical moves forward with this investigation and researches findings of the out­of­body experience, multiple dimensions and remote viewing. Film 3, The Path: Evolution then asks the question, what do we now do with the information that there are many dimensions to be explored in the universe and how do we evolve our consciousness with this knowledge? The Path Evolution film explores the theory that human beings are living in a virtual reality system similar to the rules of an assimilated video game. The film briefly discusses the societal fears of the Mayan calendar ending in 2012, and delves into the importance of humans moving more towards a state of love and cooperation as a vital part of life in order for consciousness to evolve. This entry was posted in Archives and tagged April Hannah, evolution, Intuitive Counseling, intuitive counselor, Laurie Huston, love vs fear, Michael Habernig, News for the Heart, News for the Heart Radio, The Path: Evolution, Tom Campbell. Bookmark the permalink.